Andy did a Q&A, and then we were treated to a reading from In the Valley of the Sun. (It made me want to read it all over again.) I also got to meet Andy's wife Crystal (she's absolutely adorable and a great champion of Andy's work), Bob Pastorella who is also a horror author and a co-host of the This is Horror podcast, and Kenneth DeVille, a local author. Who knew July was going to be such a huge month for horror releases? Last week I posted all of the horror books releasing in July. Go check them out! 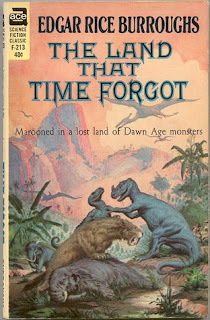 After reading Edith Wharton's Summer, I was still in the mood for a classic so I read The Land that Time Forgot by Edgar Rice Burroughs. 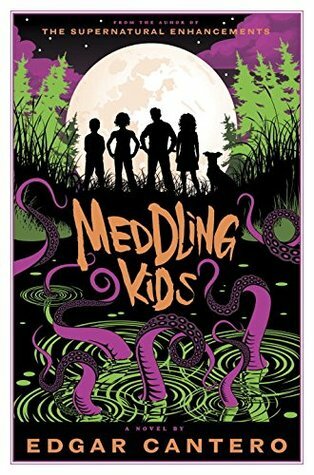 I also read Edgar Cantero's Meddling Kids. Guys, it was worse than Little Heaven for me. I need a quick slump busting read stat! I finished season one of Game of Thrones. I knew not to get attached to anyone, but wow, that was fast!! I finally watched John Wick: Chapter 2. I watched the first couple of episodes of The Mist. The characters are annoying (classic Stephen King TV, amirite? ), but the show is getting scary and I dig that. We've had a couple additions to the summer of board games recently with Tsuro (a tile laying strategy game) and Forbidden Island (our first co-op game). They are both gorgeous games and so far a lot of fun, too! Wimbledon! Wimbledon is my super bowl so these two weeks are always a favorite of my summer. The first week has been a big disappointment as far as sportsmanship goes, but I'm going to shake it off and enjoy every minute of week 2 tennis. Hmmm...slump busting book? I recommend a wonderful children's book like Wonder or a graphic novel. Good luck! A graphic novel is a great suggestion!! I'm going to scope out the library tomorrow. I've never been to a book signing before so that sounds like a fabulous way to spend the weekend. Oh yeah, definitely don't get too attached to anyone in Game of Thrones. I've learned that the hard way season after season and yet still find myself attached to quite a few characters. Amazing show though. I hope you find a good slump busting book soon! My mom started to tell me her favorite character yesterday, and I made her stop because oddly enough... knowing that a character is still ALIVE is a spoiler! Haha. I'm going to start my reread of IT today so that should help with the slump! Been meaning to watch John Wick too. I'm working on reading It. Didn't know it was one of those chunky books before getting it. It will be a challenge to get through in time for the movie as there are other required reading books on my nightstand. IT is huge! Hopefully spreading it out over 10 weeks will help. The Land that Time Forgot sounds like an interesting read! The Land that Time Forgot was interesting. I love going back and checking out the classics. Oh no! Worse than Little Heaven? I now called books that cause slumps as ones that have "the little heaven effect." I have high hopes for this one but am bummed you didn't like this one. I still plan on giving it a chance but I may have to be prepared to DNF it. Ugh, yes! It was worse than Little Heaven. :( I'm mad at it. LOL. Definitely give it a chance - the very beginning was great - but I'm happy to hear you are open to DNFing. I know that's hard for you to do! Ooh The Land That Time Forgot. I read that a while back, I love some of those old Burroughs stories. Love that old school cover! I watched the first episode of The Mist, I need to get caught up. Sad to hear that about Meddling Kids because I loved Supernatural Enhancements. Did he write that? I remember wanting to read that. I'm curious what his writing style was like in Supernatural Enhancements. I can't help you with the book slump, sorry!! I'm slumping myself :( But I'm stoked that you watch Wimbledon, too!! I missed who was acting badly, besides Mek-la-whoever with the coin tossing "bribing". That was pretty funny for Wimbledon. I was crushed watching Mattek-Sands and seeing Safranova (sp?) come running over from the other courts. Broke my heart. And then MS's Facebook video - perfect!! Sorry you are slumping, too!! Thankfully I started reading IT yesterday so all is well for now. YES, Wimbledon! That coin throwing stuff was so weird! I'm tired of what players are getting away with. I'm glad they heavily fined Tomic. When you have multiple people retiring early in round one just to get their prize $$ and go home... it makes me angry. I'm really angry for those players who just barely missed the cut. Now the US Open is changing some of their rules to actually accommodate cheaters (coaching from the box, allowing hand signals of all things!). I'm disheartened. And yes! Mattek-Sands is so heartbreaking. Mary Carillo did a touching get well soon tribute on Tennis Channel. It made me tear up. Book signings are such fun and they ever happen here :( Book slumps are the worst. I avoid them by mixing up genres and formats. Sometimes simply doing something else for a few days helps. Hope this week is as good one. Thankfully the IT readalong has saved me. I don't have to think of what I'm going to read next just yet. It will probably be something short for now. I had such hopes for Meddling Kids. I hope you get over your reading slump quickly. Have a great week! I had very high hopes for it. :( Thank you! How awesome that you got to meet the authors. I haven't been to many book signings, since the authors I read don't really come here that often or ever. I hope I'll be able to go someday. Game of Thrones.. Yes.. When you start, you just don't want to stop. I'm very lucky that this particular bookstore has opened and is working to get great authors in. Hopefully I will get caught up on GoT soon so I don't get too spoiled when it comes back on. I haven't been to a book signing for a while. I miss getting to meet authors and hear them talk about their books. I hope you have a wonderful reading week. Come see my week here. Happy reading! Thanks, Kathy! We had a really great time. I hope you enjoy your reads. Have a good week. Always a big buzz to meet up with a fav author. I'm very fortunate to have been given the opportunity! My husband usually gets into Wimbledon. I think our move has him too distracted. We're in the last few days in our current place. It seems like the work to move will never end. Come see what I'm reading when I'm not packing. You can see the light at the end of the tunnel now, though! Poor hubs. Maybe this weekend he will get to spend some time watching the finals. If not, you guys will be so happy when the move is final! Oh no I am so sorry to hear about Meddling Kids!!! I was looking forward to reading it. Now I think I will skip it. We are watching The Mist as well- and yes, the characters! Although, I do think that mother-daughter combo was such good casting. They look alike to me. Lol. We are also watching the Tour de France. Have a great week, hopefully you read a good book! 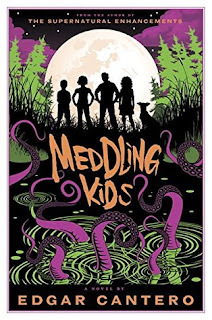 I'm going to post a review tomorrow for Meddling Kids. I think I'm going to quit The Mist. :( I didn't realize the Tour de France was going on right now! Glad you could go meet that author :) have a great reading week!